Hydrogen Is A Type Of Gas. Hydrogen has the chemical symbol H.
Hydrogen is a chemical element. Hydrogen has the atomic number of 1. At Standard temperature and pressure hydrogen is a colorless, odorless, nonmetallic, tasteless, highly flammable diatomic gas (H2). With an atomic mass of 1.00794 g/mol, hydrogen is the lightest element. Hydrogen is also the most abundant, constituting roughly 75% of the universe's elemental mass. stars in the main sequence are mainly composed of hydrogen in its plasma state. Elemental hydrogen is relatively rare on Earth, and is industrially produced from hydrocarbons, after which most free hydrogen is used "captively" (meaning locally at the production site), with the largest markets about equally divided between fossil fuel upgrading (e.g., hydrocracking) and in ammonia production (mostly for the fertilizer market). However, hydrogen can easily be produced from water using the process of electrolysis. History and discovery of hydrogen: (H2). Hydrogen gas, H2, was first artificially produced and formally described by T. von Hohenheim (also known as Paracelsus, 1493-1541) via the mixing of metals with strong acids. He was unaware that the flammable gas produced by this chemical reaction was a new chemical element. In 1671, Robert Boyle rediscovered and described the reaction between iron filings and dilute acids, which results in the production of hydrogen gas. In 1766, Henry Cavendish was the first to recognize hydrogen gas as a discrete substance, by identifying the gas from a metal-acid reaction as "inflammable air", and further finding that the gas produces water when burned. Cavendish had stumbled on hydrogen when experimenting with acids and Mercury. Although he wrongly assumed that hydrogen was a liberated component of the mercury rather than the acid, he was still able to accurately describe several key properties of hydrogen. He is usually given credit for its discovery as an element. In 1783, Antoine Lavoisier gave the element the name of hydrogen when he (with Laplace) reproduced Cavendish's finding that water is produced when hydrogen is burned. Lavoisier's name for the gas won out. Role of hydrogen in history of quantum theory. One of the first quantum effects to be explicitly noticed (but not understood at the time) was Maxwell's observation, half a century before full quantum mechanical theory arrived. He observed that the Specific heat capacity of H2 unaccountably departs from that of a diatomic gas below room temperature and begins to increasingly resemble that of a monatomic gas at cryogenic temperatures. According to quantum theory, this behavior arises from the spacing of the (quantized) rotational energy levels, which are particularly wide-spaced in H2 because of its low mass. These widely spaced levels inhibit equal partition of heat energy into rotational motion in hydrogen at low temperatures. Diatomic gases composed of heavier atoms do not have such widely spaced levels and do not exhibit the same effect. 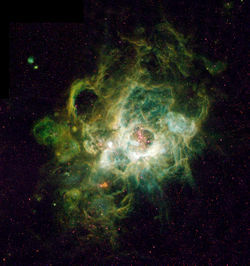 NGC 604, a giant region of ionized hydrogen in the Triangulum Galaxy. 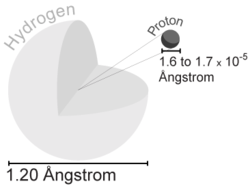 The hydrogen atom: Electron energy levels. 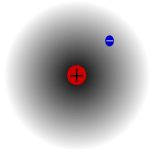 Depiction of a hydrogen-1 atom, or protium, showing the Van der Waals radius and the proton nucleus. Protium, the most common isotope of hydrogen, has one proton and one electron. Unique among all stable isotopes, it has no neutrons. (see diproton for discussion of why others do not exist). Hydrogen has three naturally occurring isotopes, denoted1H,2H, and3H. Other, highly unstable nuclei (4H to7H) have been synthesized in the laboratory but not observed in nature. 2H, the other stable hydrogen isotope, is known as deuterium and contains one proton and one Neutron in its nucleus. Deuterium comprises 0.0026-0.0184% of all hydrogen on Earth. It is not radioactive, and does not represent a significant toxicity hazard. Water enriched in molecules that include deuterium instead of normal hydrogen is called Heavy water. Deuterium and its compounds are used as a non-radioactive label in chemical experiments and in solvents for1H-NMR spectroscopy. Heavy water is used as a neutron moderator and coolant for nuclear reactors. Deuterium is also a potential fuel for commercial nuclear fusion. Hydrogen is the only element that has different names for its isotopes in common use today. (During the early study of radioactivity, various heavy radioactive isotopes were given names, but such names are no longer used). The symbols D and T (instead of2H and3H) are sometimes used for deuterium and tritium, but the corresponding symbol P is already in use for phosphorus and thus is not available for protium. IUPAC states that while this use is common it is not preferred. Elemental molecular forms of hydrogen. 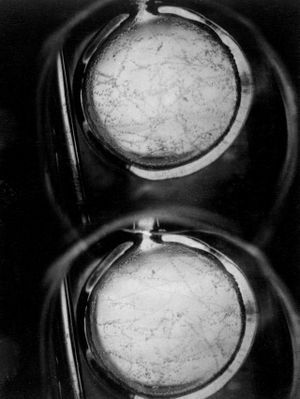 First tracks observed in liquid hydrogen bubble chamber. 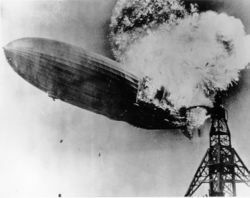 Hydrogen can combust rapidly in air, and was blamed for the disaster with Hindenburg on May 6, 1937. Hydrogen gas is highly flammable and will burn at concentrations as low as 4% H2 in air. The enthalpy of combustion for hydrogen is -286 kJ/mol; it combusts according to the following balanced equation. In Inorganic chemistry, hydrides can also serve as bridging ligands that link two metal centers in a coordination complex. This function is particularly common in group 13 elements, especially in boranes (boron hydrides) and aluminum complexes, as well as in clustered carboranes. Compounds of hydrogen are often called hydrides, a term that is used fairly loosely. To chemists, the term "hydride" usually implies that the H atom has acquired a negative or anionic character, denoted H-. The existence of the hydride anion, suggested by G.N. Lewis in 1916 for group I and II salt-like hydrides, was demonstated by Moers in 1920 with the electrolysis of molten lithium hydride (LiH), that produced a stoichiometric quantity of hydrogen at the anode. For hydrides other than group I and II metals, the term is quite misleading, considering the low electronegativity of hydrogen. An exception in group II hydrides is BeH2, which is polymeric. In lithium aluminum hydride, the AlH4- anion carries hydridic centers firmly attached to the Al(III). Although hydrides can be formed with almost all main-group elements, the number and combination of possible compounds varies widely; for example, there are over 100 binary borane hydrides known, but only one binary aluminum hydride. Binary indium hydride has not yet been identified, although larger complexes exist. Hydrogen can be prepared in several different ways but the economically most important processes involve removal of hydrogen from hydrocarbons. Commercial bulk hydrogen is usually produced by the steam reforming of natural gas. At high temperatures (700-1100 ºC; 1,300-2,000 ºF), steam (water vapor) reacts with methane to yield Carbon monoxide and H2. Water splitting, in which water is decomposed into its component protons, electrons, and oxygen, occurs in the light reactions in all photosynthetic organisms. Some such organisms - including the alga Chlamydomonas reinhardtii and cyanobacteria - have evolved a second step in the dark reactions in which protons and electrons are reduced to form H2 gas by specialized hydrogenases in the Chloroplast. Efforts have been undertaken to genetically modify cyanobacterial hydrogenases to efficiently synthesize H2 gas even in the presence of oxygen. Hydrogen as an energy carrier. Having been used as an ingredient in some rocket fuels for several decades, hydrogen, or more specifically H2, is now widely discussed in the context of energy. Hydrogen is not an energy source, since it is not an abundant natural resource and more energy is used to produce it than can be ultimately extracted from it. However, it could become useful as a carrier of energy, as elucidated in the United States Department of Energy's 2003 report, "Among the various alternative energy strategies, building an energy infrastructure that uses hydrogen - the third most abundant element on the earth's surface - as the primary carrier that connects a host of energy sources to diverse end uses may enable a secure and clean energy future for the Nation." The hydrogen would then locally be converted into usable energy either via combustion of fossil fuels or by electrochemical conversion into electricity in a fuel cell. Other considerations in the hydrogen debate.